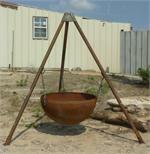 We manufactureour our own line of custom iron fire pits using what's called "Pressure Vessel Tank Heads". This is the curved part of the fire pit. Take a look at the line we have designed and notice we are using only three tank profiles but with different components. So look at the different options. Click on the "Tiger" below and click on "View More Images". This gives better detail of some of the options available but we can do just about anything you might desire. It's best to call Jim 817.946.6463 and talk about it. These types of tank fire pits are all over the internet. Google it.